Over the next few columns I will be looking at the way in which the late-13th century clash between Pope Boniface VIII and the King Philip IV of France over taxation and legal jurisdiction launched a half-century long period of intense political and intellectual conflict over that most central and consequential geopolitical question: where did the epicentre of supreme political authority lie in Medieval Latin Christendom? The conflict between the pope and the king of France began innocently enough. In the later decades of the 13th century, Philip began taxing members of the French clergy in order to help finance his war against England. While formally prohibited by a decree of the Fourth Lateran Council, the papacy had long acquiesced in the practice of French lay rulers taxing their clergy without explicit papal authorization, largely because it depended on French support in its perennial conflicts with the Holy Roman Emperor. In 1296, however, Boniface decided to apply the prohibition to France as well as the Empire. Historians disagree as to why he made this fateful decision. On the one hand, there are those who assert that the new pope was simply acting on the basis of his firmly held “hierocratic” belief that papal power was superior to temporal power. On this view, Phillip’s decision to tax the French Church presented Boniface with his first real opportunity to assert ecclesiastical authority – an opportunity he seized enthusiastically. On the other hand, there are those who emphasize the role played by Boniface’s ardent desire to launch a crusade to recover the Holy Land. From this perspective, the pope’s decision had less to do with his hierocratic vision and more with his belief that clerical tax revenues should not be used to sustain a war between Christian rulers, especially when that war was keeping those rulers from “taking the cross” and fighting to liberate the Holy Land. Whatever his motivation, in February 1296 Boniface issued the bull Clericis laicos, expressly prohibiting all lay rulers – including “emperors, kings or princes, dukes, counts or barons, podestas, captains or officials or rectors – by whatever name they are called….” – from exacting or receiving church revenues or property without prior authorization from the Apostolic See. The bull also specified the consequences of such unauthorized taxation of the clergy: guilty persons were subject to the punishment of excommunication; guilty kingdoms were subject to the punishment of interdict (which entailed a complete ban on the celebration of the sacraments). Perhaps predictably, Philip responded swiftly to what he perceived to be Boniface’s threat to both his political authority and his ability to prosecute his war against England. Within a few months of the promulgation of Clerics laicos, Philip issued a royal ordinance forbidding the export of “horses, arms, money and similar things” from the kingdom. Given the dependence of the papacy on revenues from France, this ordinance put Boniface in very uncomfortable position. When Philip increased the pressure by issuing a proclamation (never promulgated) obliging the French clergy to contribute its fair share to the public purse and asserting the revocable character of ecclesiastical immunities, Boniface found himself in an utterly untenable position. In an effort to placate Philip, the pope then issued a second bull, Ineffabilis amor, in which he explained that Clericis laicos had never been intended to forbid “voluntary” donations to the royal coffers or prohibit exactions necessary for the defense of the realm. This was not enough to mollify Philip, however. 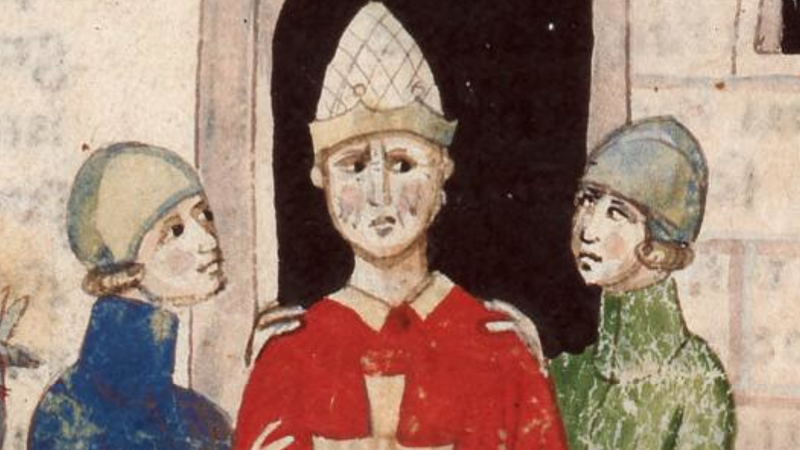 In 1297, Boniface’s deteriorating position in Italy forced him to concede Philip’s terms and explicitly recognize the right of the French king to tax the French clergy. In a humiliating reversal, the pope issued yet another papal bull, Esti de statu, which exempted the French king from the provisions of Clericis laicos and conferred upon him the right to tax the French church without prior papal permission. Satisfied that he had secured his rights and revenues, Philip subsequently withdrew his ordinance forbidding the export of gold and silver, effectively bringing the conflict to an end. In 1301, however, tensions between Philip and Boniface flared up again when Philip arrested the Bishop of Pamiers, Bernard Saisset. Boniface had sent Saisset to France to protest continuing abuses of the Church and to urge Philip to apply the revenues raised from taxing the Church to a crusade. But the Bishop had done more than that – he had publicly slandered the king and, indeed, France. In response, Philip had him arrested and charged with treason. The problem from Philip’s perspective was that, according to canon law, Saisset was under papal jurisdiction and thus not liable to prosecution in civil court. If Philip were to have any chance of bringing Saisset successfully to trial, he would first have to obtain from the pope a “canonical degradation” that would remove the bishop from his see and strip him of his clerical immunities. In pursuit of this dispensation, the king sent a delegation to Rome to meet with Boniface. Concerned as always with the liberties of the Church, however, and no doubt still smarting from the humiliation suffered during his last dispute with Philip, Boniface not only refused the delegation’s request, but demanded that Philip release the bishop immediately. Philip agreed to this and permitted Saisset to return to Rome unjudged, but did so too late to prevent the publication of two papal bulls directed against him. In the first, Salvator mundi, Boniface revoked the concessions made in Esti de statu. In the second, Asculta fili, he asserted the pope’s authority to judge kings, enumerated the church’s grievances against Philip, and summoned France’s principal ecclesiastics to Rome to judge the French king and discuss means of reforming him and his kingdom. Once again, Philip and his supporters reacted vigorously to what they perceived to be Boniface’s wholly illegitimate attempt to assert papal superiority over the French king in temporal matters. In reality, of course, those parts of Asculta fili that touched on the distribution of power between the spiritual and temporal realms were not particularly novel. Simply put, while Boniface’s bull asserted absolute papal authority in the spiritual realm, it proclaimed only a qualified papal authority to exercise temporal jurisdiction in cases where sin was involved (ratione peccati) – a doctrine first made explicit in Innocent III’s decretal Per venerabilem (1202) and adhered to by all subsequent popes. As Boniface was later to try to explain, it did not imply papal supremacy in temporal affairs except in certain limited cases where the temporal authorities had gravely erred. But whereas in the thirteenth century these arguments had been primarily directed against the Emperor as part of the Church’s long-running struggle to maintain the liberty of the Church (libertas ecclesiae), now they were being applied to territorial kingdoms like France – kingdoms that had hitherto enjoyed almost complete operational control of their territories and considerable jurisdiction over their national churches. The novelty of Boniface’s confrontational approach to France, coupled with the hierocratic tone of the bull, must have left the impression that Boniface was engaged in a radical new political project – one intended to subjugate the Kingdom of France to Rome. Perhaps not surprisingly, the reaction of Philip and his supporters to Asculta fili was ferocious indeed. The French response was almost immediate. When the Archdeacon of Narbonne attempted to present the bull to Phillip on 10 February 1302, a member of the king’s court seized it from his hands and threw it into a blazing fireplace. The king’s supporters then set about suppressing Boniface’s actual bull, preventing it from being circulated to the French clergy. Having accomplished this, Philip’s men – almost certainly with the king’s knowledge and approval – proceeded to circulate a forged bull, known as Deum time (“Fear God”). This forgery effaced the nuanced theological arguments underpinning (and limiting) Boniface’s claim to ultimate (though not operational) supremacy under the doctrine of ratione peccati, falsely representing Boniface as asserting that the king of France was absolutely subject to him in both spiritual and temporal matters. This forged bull was followed by a similarly counterfeit reply, known as Sciat maxima tua fatuitas (“May Your Very Great Fatuity Know”), which further inflamed passions among those favoring the king and his cause. Ratcheting up the pressure even more, Philip forbade the French bishops to go to Rome to attend the ecclesiastical council called by Boniface. He then summoned a counter-council of his own to meet in Paris in April 1302. At this council, generally regarded as being the first ever meeting of the French Estates General, Philip’s chancellor delivered an impassioned speech in which he denounced Boniface for seeking to usurp not only the king’s authority in temporal matters but also the ancient liberties of the French church in matters spiritual. For their part, the French clergy adopted a less hostile tone, but essentially sided with the king, warning Boniface that his call for a council to judge Philip had placed the French church in grave danger and imploring him to abandon the whole enterprise. The council then appointed a delegation to deliver the letters to the College of Cardinals, which it dutifully did on 24 June 1302. The delegation was received in a public consistory at Anagni, a small Italian town near Rome. Cardinal Matthew of Acquasparta responded to the letters first, forcefully denying the claim that the pope was attempting to usurp the temporal authority of the French king. Asculti fili, the cardinal argued, merely reiterated established church doctrine that all men, even kings, are subject to the spiritual jurisdiction of the pope and that their acts could therefore be judged by him on spiritual grounds. Boniface himself offered the second formal response. He began by censuring Philip’s chancellor for disseminating the falsified bull Deus time. He then proceeded to deny the claim that he was seeking to make France a papal fief, suggesting that as a doctor of both canon and civil law he simply could never have conceived such a ludicrous idea. Finally, Boniface emphatically stated that the ecclesiastical council he had called to judge Philip would continue as planned and instructed French clergymen to attend or face the loss of their sees. Determined to undermine Boniface’s planned council, Philip and his supporters took a number of extraordinary steps to prevent French ecclesiastics from travelling to Rome, including threatening to confiscate the property of any French churchman who attended the council. The result was predictable. When it convened on 30 October 1302, fully half of the French prelates were not in attendance, and of those who did, a substantial number were sympathetic to the king and his cause. Participation was also skewed regionally; as a result of intense lobbying on the part of Phillip’s men, almost no prelates from the north of France were in attendance. Divided internally and representative of only part of the French church, the council was effectively hobbled from the outset. Doubtless to Philip’s relief, it pronounced no finding or judgment relating to the king’s alleged abuses of the French church. Indeed, although the proceedings have not survived, it appears that the council achieved nothing of consequence at all other than issuing a condemnation of Philip’s chancellor, Pierre Flotte. But if the council was a setback for the pope, he recovered quickly, launching yet another attack against Philip during the month of November. This time, though, the assault took the form of neither a direct attack on Philip’s policies nor a specific judgment of his conduct. Rather, Boniface’s offensive came in the form of a bull, Unam sanctam, that mentioned neither Philip nor France, but that instead articulated in general terms the theological case for papal supremacy. Promulgated on 18 November 1302, the bull began by asserting the premise that the “holy, catholic and apostolic church” was the mystical body (corpus mysticum) of Christ and that, as such, had only one head, Christ’s vicar, the Roman pontiff. The bull then went on to state that the Roman pontiff, as head of Christ’s mystical body, wielded two swords (i.e., powers): the spiritual one, which he wielded directly; and the temporal one, which he wielded indirectly through the earthly power. Explicitly citing the hierocratic writings of Pseudo-Dionysius, the bull then made the case that the spiritual power was above the temporal “in dignity and nobility” and that by virtue of this the “spiritual power has to institute the earthly power and to judge it if it has not been good.” Echoing Aquinas, the bull concluded with an emphatic statement of papal supremacy: “therefore we declare, state, define and pronounce that it is altogether necessary for the salvation of every human creature to be subject to the Roman pontiff.” Notably absent were any complicated proofs, temporizing language or principled qualifications. Although it drew on established theological arguments regarding hierarchy (Pseudo-Dionysius), the theory of the Two Swords (Bernard of Clairvaux), and the superiority of papal jurisdiction (Hugh of St. Victor, Thomas Aquinas), and although it was leavened with juristic concepts regarding the mystical body of Christ, the document was less an argument for the hierocratic thesis than a bold assertion, grounded in precedent and tradition, of the doctrine of unqualified papal supremacy over all temporal rulers. The French response to Unam Sanctam took some time to materialize, but when it finally did become manifest it was both decisive and violent. In March 1303, the Estates General met once again, this time roundly denouncing Boniface as a false pope, simoniac, thief and heretic. In June, another meeting of the prelates and peers of the realm took place in Paris. At this meeting, supporters of Philip arranged to have twenty-nine formal charges of heresy brought against the pope. Boniface denied the charges, of course, and formally cleared himself of them at a consistory at Anagni in August 1303. He then went on the counterattack, excommunicating a number of prelates, suspending the right of the University of Paris to confer degrees in law and theology, and reserving all vacant French benefices to the Apostolic See. Fatefully, he also prepared the bull Super Petri solio, which would have formally excommunicated Philip and released his subjects from their obligations to him. Before he could promulgate it as planned, however, Boniface found himself under attack from a French army that had arrived in Italy. He was soon seized by Philip’s men who planned to force him to abdicate or, failing that, bring him to trial before a general council in France. It is likely that he was physically assaulted by the soldiers. The plan quickly fell apart, however, and the pope was released from captivity three days later. Boniface returned safely to Rome on 25 September, only to die of a violent fever on 12 October 1303.